ImTranslator for Chrome translates words, phrases, texts and webpages between more than 90 languages using Google, Microsoft Bing and Translator. The extension includes 4 translation applications and supports language detection, text-to-speech, dictionary, translation history and more. ImTranslator for Firefox is one of the most popular add-ons for Firefox. The extension translates words, phrases, texts and webpages between more than 90 languages using 3 translation providers: Google, Microsoft Bing and Translator. ImTranslator has been downloaded over 23 million times. ImTranslator for Opera performs translations of words, phrases, texts and webpages between 91 languages using 3 translation providers: Google, Microsoft Bing and Translator. The extension supports language detection, text-to-speech, dictionary, translation history and more. Google Translate for Opera translates text, words, phrases and webpages between over 90 languages using Google Translate service. This extension supports language detection, back translation, text-to-speech, dictionary, translation history and settings customization. ImTranslator for Yandex performs quick translation of a selected text, words, phrases and webpages between 91 languages and 3 translation providers (Google, Microsoft, Translator). ImTranslator is available on Yandex.Browser via Opera browser extensions. Google Translate for Yandex translates selected texts, words, phrases and webpages between more than 90 languages using Google Translate service. This extension is available on Yandex.Browser via Opera browser extensions, and is fully compatible with Yandex browser. Translation Comparison for Chrome translates words, phrases and texts, and compares the translation results between various online translation providers: Google Translate, Microsoft Bing Translator, Yandex Translator and Translator. Translation Comparison for Firefox translates words, phrases and texts, and compares the translation results between various online translation providers: Google Translate, Microsoft Bing Translator, Yandex Translator and Translator. Translation Comparison for Opera translates words, phrases and texts, and compares the translation results between various online translation providers: Google Translate, Microsoft Bing Translator, Yandex Translator and Translator. Translation Comparison for Yandex translates words, phrases and texts, and compares the translation results between various online translation providers: Google Translate, Microsoft Bing Translator, Yandex Translator and Translator. Founded in 1993, Smart Link Corporation is a developer and publisher of multilingual software products and web-based solutions. Since 2000, the company has focused on designing a complete, yet affordable business solution for multilingual communications by developing and integrating innovative language technologies in the Internet and Intranet environments. Online Translator performs real-time instant translation of words, phrases and texts between more than 90 languages. 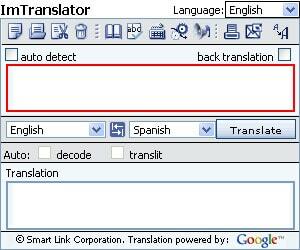 The translation is powered by Google Translate, Microsoft Bing Translator and other machine translation engines. Spellink is a spell-checking server that specializes in spell-checking multilingual text. Spellink Server provides a full-featured, high-quality spell-checking tool for 8 European languages. Virtual Keyboard is a web-based application for text input in foreign languages that can provide additional multilingual support, as well increase login security. Virtual Keyboard has customizable layout and size options and multiple text input methods for 58 alphabet systems. Dictionary Server delivers a web-based version of bilingual dictionaries for 8 European languages and their combinations. Dictionary Server provides translation of words, common phrases and idiomatic expressions for 20 language pairs. Decoder is a server-based application that solves the problem of incorrect displays of Russian characters in emails by identifying 5 of the most common encodings and converting these encodings into Russian characters. The Solutions Guide presents a spectrum of smart solutions and tips for the products listed on this page. A simple and logical navigation system will guide you through the products' functionalities and potential implementation.